Fig.1 shows the equivalent circuit of a series regulator. The DC voltage Vin is applied to the series of the voltage regulator Rs and the load Rc. The output voltage is kept constant by controlling the voltage drop on Rs. 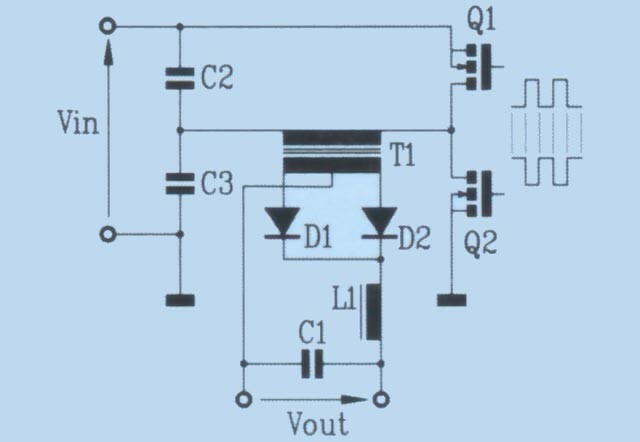 The regulation block include a power transistor with its driver and a feedback circuit. The efficiency of a series regulator is low, between 30% and 50%, because of the power wasted by the pass transistor. It is also used as post-regulation stage. The very low efficiency of linear regulators has determined the success of switching power supplies in electronic equipment. Switching regulators typically operate at frequencies between 20 kHz and 1MHz , they are much smaller and their efficiency can be as high as 95%. Major technological efforts are being made to further reduce the power loss. Fig.2 shows the principle of operation, where the mean value of Vout is determined by the “Duty Cycle” of the signal driving TR1. Many topologies are available, depending on rating power and supply voltage. The more commonly used are outlined below. The basic configurations are: buck, boost and flyback. They employ the same elements but placed in different manner. The switching transistor is controlled by a PWM (Pulse Width Modulation) circuit and the output is regulated according to a feedback signal. With the buck conversion technique it is possible to build voltage regulators with a wide input voltage range and a very high efficiency (typically more than 90%). The boost configuration steps up the input voltage and is very useful for a pre-regulation stage with PFC correction. Its efficiency is very high too (more than 90%). Fig.5 shows the off-line type topology. When Q1 conducts, energy is stored in the primary side of the transformer. When Q1 is switched off, the so called “flyback” moment, the polarity of the transformer is reversed causing D1 to conduct and the stored energy to be delivered to the output. In a flyback converter the primary and secondary currents are never simultaneous. The output voltage regulation is achieved through a PWM circuit. The ratio between the ON and the OFF time of Q1 is varied in order to control the amount of energy stored in the transformer. More energy stored results in a higher output voltage. An equally popular technique is the auto-oscillating flyback, where the output voltage is controlled by varying the switching frequency. The flyback conversion has a longer transient response time and higher output ripple than other techniques. On the other hand, thanks to the smaller number of components used, it is cheaper and more reliable up to 100 W.
This technique is widely used for power between 100W and 300W. In this topology the transformer’s windings have the same polarity and the energy is stored in the inductor L1. When Q1 conducts, energy is transferred to the output through T1, D1 and L1. When Q1 is interdicted, the polarity of the transformer is reversed causing the D1 interdiction, while D2 is forward biased allowing L1 to continue to deliver energy to the output. The design must allow a complete reset of the magnetic core before the beginning of the next cycle. The control circuit employs a PWM technique, with the output voltage proportional to the ON time of Q1. This type of converter generates less ripple, less EMI and has a shorter transient response time than the flyback converter, due to the fact that L1 supplies energy to the output during both cycles. This technique is often employed for isolated DC-DC converters, with wide input voltage excursion. The push-pull converter is an extension of the forward converter. It automatically provides the core reset on alternate half cycles, but the cycles must be very symmetrical to avoid core saturation. This converter is similar to the forward, with the same energy transfer process. The two switching transistors connect the transformer primary winding across the two input capacitors alternately. Primary currents and voltages are symmetrical. The secondary voltage square wave is rectified by the diodes and smoothed by L1 and C1. The half bridge converter is employed in power supplies with power between 150W and 600W. The full bridge converter is a higher power extension of the half bridge. The switching operation is done by the pairs Q1-Q3 and Q2-Q4. The transformer primary voltage is double than that of the half bridge, so it draws half current for the same power delivery. For this reasons it is employed in medium-high power PSU.